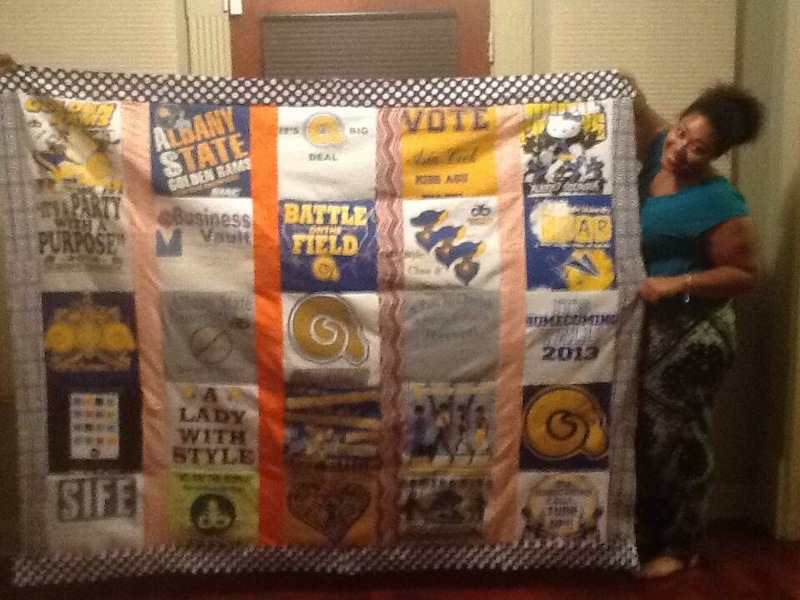 What better way to hang on to your old t-shirts than a quilt that will last forever? I remember packing up my college (undergrad) apartment throwing nearly everything away, except my spirit and organization shirts. I actually boxed about 30 shirts up and put the box in the trunk of my car. Half of the t-shirt I’d outgrown, but I wasn’t ready to get rid of them. I’d seen t-shirts on Pinterest before and thought about researching a place I could get one custom made with my own t-shirts. Never did I think I would end up doing it myself. After about 2 years (literally) of riding around with the box of t-shirts in my trunk, my mom invited me to an event at my childhood church. She said it was a women’s ministry event- that they would be making t-shirts quilts, wreaths and scrapbooks. I was thinking to myself there is no way a person can do that all in one day. But I thought it would be the perfect opportunity to start my t-shirt quilt. Once I got to the event, I saw that the activities were split up. There was a lady there to teach women how to make wreaths. Another lady was there to help women create scrapbooks. And the host of the event brought a t-shirt quilt she made for her daughter to show and teach women how to make. So I was excited. I decided instead of paying someone- I will make it myself. My mom thought it would be nice to turn all of her family reunion t-shirts over the years into quilt. So it was our little mommy and me project. I was determined to complete mine in one day. But everyone was telling me to take my time and “you don’t have to finish it in one day.” I was determined. I lose interest in things quickly, so I knew that if that quilt wasn’t complete that day, it wasn’t going to ever get done and I would have just cut up all my t-shirts for nothing. So after about 6 hours at the church working on the prep stages on the quilt making with my mom, when ended up having to leave and go to another event. I was a little upset. So the host old me to give her a call later that night and she would come over to our house and help me continue my quilt. And I did exactly that. She came over with her sewing machine and supplies and we got to work. I did more working, while my mom did more talking. So at about 3am I had my front panel of my quilt complete. And I’ll tell you one thing, making a quilt is a workout. First thing the next morning I went to Walmart and purchased some flannel materials for the back of my quilt and when back home to sew it on. After making this quilt for myself I was super proud and of course I had to show it off. Lots of people asked how much I would charge to make them one- my response “I don’t sell them, I just did this one for me”. I was not into the quilting lifestyle at that time. But fast forward a few months later, I started a baby quilt for a friend. One order came after another for those baby quilts. I was cool with making baby quilts because they are a lot easier than t-shirt quilts. For more pictures of my handmade quilts, click on my Kreative Passions page, for ordering information check out my Etsy Shop (www.etsy.com/shop/passionlocked). And for first looks at all my kreatives follow @passionlocked on Instagram. Ms. Kadij of Kreative Passion I really do enjoy looking and using my quilt. Its very special to me because my father and grandmother made sure that our family had a reunion year after year. Now they both are gone and our family is having less reunion. Its sad when family don’t want to come together but to attend a funeral and say its like a reunion seeing family from near and far for a couple of hours while mourning one of your love ones. 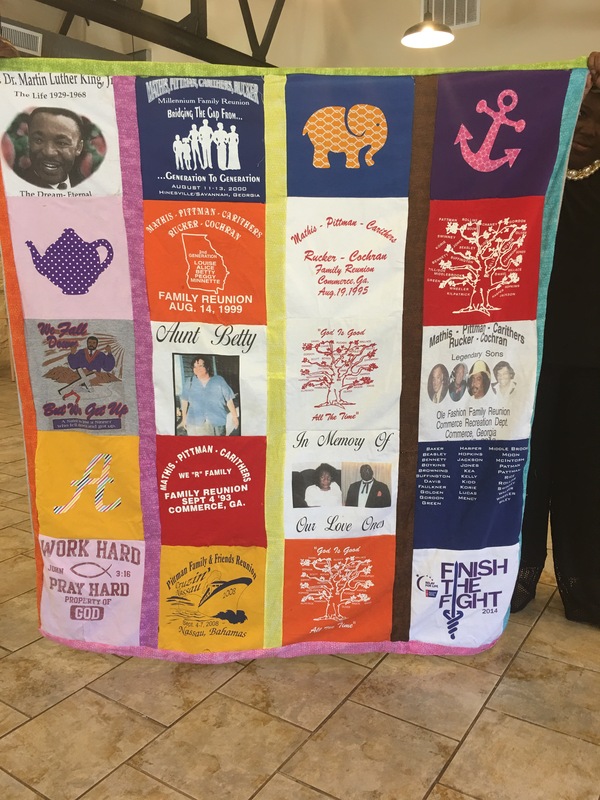 I hope my story will help someone who has shirts they don’t wear but are a special memory to turn their shirts into a special quilt. Love it and receiving it on Mother Day was very special too me.